Latest data compiled by the Central Statistical Bureau (CSB) show that 2.58 mln visitors stayed at Latvian tourist accommodation establishments in 2017, which is 11.9% more than during 2016. Compared to the previous year, the number of nights spent by visitors increased by 12.1%, reaching 4.95 mln. The average length of stay comprised 1.9 nights. Over 2017, 1.78 mln foreign visitors were hosted, which is 13.0% more than previous year, whereas the number of nights spent by them increased by 11.9%, reaching 3.41 mln. In 2017, 798.4 thsd Latvian residents were hosted at tourist accommodation establishments, which is 9.4% more than in 2016, whereas the number of nights spent increased by 12.6%, constituting 1.54 mln. The majority of foreign visitors came from Russia (241.4 thsd), Germany (207.8 thsd), Lithuania (181.3 thsd), Estonia (161.2 thsd), Finland (114.9 thsd) and the United Kingdom (95.4 thsd). In 2017, significant increase was observed in the number of visitors coming from Canada (4.9 times), Israel (41.8%), Denmark (16.6%), Austria (15.7%), Russia and France (15.6%). 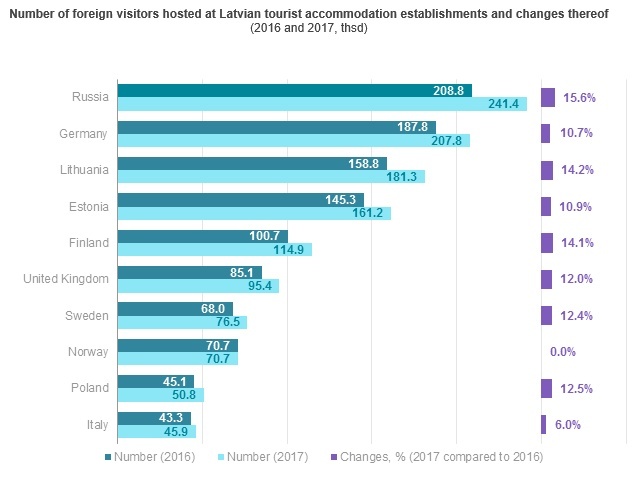 Out of the total number of foreign visitors, 34.9% or 620.6 thsd came from the neighbouring countries of Latvia – Russia (13.6%), Lithuania (10.2%), Estonia (9.1%) and Belarus (2.1%). Over the 4th quarter of 2017, 521.7 thsd visitors were hosted at tourist accommodation establishments – 12.8% more than during the 4th quarter of the previous year. Visitors spent 991.7 thsd nights which, compared to the same period of the previous year, is increase of 9.9%. The number of foreign visitors rose by 14.2%, amounting to 360.5 thsd. More tourism statistics is available in the CSB website section Tourism – Key Indicators. The data are published in the CSB database section Tourism (Short-term statistical data and Annual statistical data).